Have you ever wondered how your support of the WSU Creamery supports the university and the state of Washington? The WSU Creamery is a self-funded entity of WSU and the State of Washington. In other words, we receive no state funding through tax payer dollars. We generate our own revenue. This revenue is used to cover operational expenses such as equipment, raw materials, packaging supplies, university administrative fees, student wages, staff salaries and benefits. As we receive no state funding, when we upgrade or expand new equipment and facilities, the expense for these projects is paid for solely by the revenue we have generated. In 2009 alone, the WSU Creamery paid over $394,000 in wages to more than 80 student employees. Your support of students at Washington State University provides for competitive wages and exceptional work experiences. After graduation, many of our employees have used their experiences at the WSU Creamery to become leaders in a wide variety of fields. WSU Creamery Development Fund Scholarship recipient Kärin Thorsen. 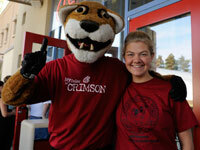 WSU Creamery Development Fund Scholarship recipient Mikaela Easter.